Just dropping in after a series of power outages that probably aren't over quite yet, to give a hat tip to Will Smith and company. 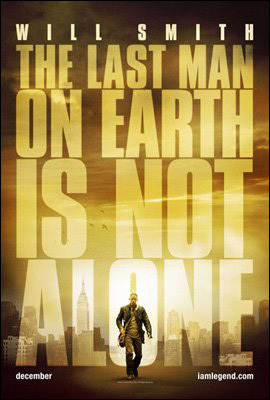 I Am Legend killed at the box office this past weekend despite a devistating winter storm that has been battering the heartland and the north east. $77 million I believe the projection was, a good 35% above expectations (note to Nikki Finke -- that's not "nearly double"..) which will undoubtedly trigger five sequels of questionable quality. I wonder what it would have done without the storms getting in the way? Regardless, it topped the December openings of everything in history, including all three Lord of the Rings films, and Narnia.